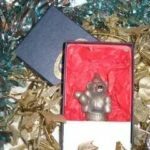 The hand crafted party bear bottle stopper in pewter and finished by hand with paint and cork. Ah yes, may I enquire why you are here ? Oh, prey tell a bottle stopper you wish to acquire. Well my good sir or madam you are indeed in the right place. I am a purveyor of the finest wine bottle stopper from all the lands….ME :-). I look smart and work smart so watch out, beneath this bow tie cuddly features is a lunatic in a fur coat waiting to burst out. The only problem is though I’ve been given this job of protecting wine and whoever buys me, gets a smart protector indeed. If you’re a smart buyer you’ll do the right thing I know it. As always call, email or use the chat box if you’re unsure about anything as we wan’t you to be absolutely certain about our products and service.